After some big gains last week and a SPX 1216 close, the market gave it all back this week with a SPX 1136 close. Economic reports were light, but still mostly to the downside. On the positive were building permits, existing home sales, the monetary base and a downtick in weekly jobless claims. On the negative were declining housing starts, FHFA/NAHB housing prices, leading indicators, excess reserves and the WLEI. The big news for the week was the ‘sterilized’ Operation Twist. A $400 bln program to purchase long term debt with short term debt. The market apparently wanted more liquidity in the form of outright purchases. For the week the SPX/DOW were -6.45%, and the NDX/NAZ were -4.85%. Asian markets lost 5.0%, Europeans markets lost 5.2%, the Commodity equity group lost 10.3%, and the DJ World index dropped 7.7%. Next week will be highlighted by Q2 GDP, the Chicago PMI and Case-Shiller. When the markets start displaying a bunch of mixed signals it is best to step back and look at the overall picture. Between March 2009 and May 2011 the stock market doubled in a five wave advance, (SPX 667-1371). After the peak the stock market experienced a modest decline to SPX 1258 and then a fairly good rally to SPX 1356. While this was unfolding many foreign markets were starting to break down. After a review of the long term technical indicators we concluded these two waves represented the beginning of a new bear market. After posting these findings the US stock market started breaking down. The decline was quite swift, and within a month the SPX dropped from 1356 to 1102, or 18.7%. The weekly chart signalled there was potential trouble ahead when the first decline, SPX 1371-1258, was quite oversold, (RSI red arrow). This typically does not occur during bull markets, as you can observe on the chart. When the market started breaking down the MACD turned negative. This also does not occur during bull markets. While OEW quantitative analysis has yet to confirm a bear market it certainly looks like we are in one. This is the reason we have been posting, since early August; “bear market highly probable”. All bear markets unfold in three significant waves, ABC, not five. They are corrections to previous bull markets of a greater wave degree. The declining A and C waves may take the form of a five wave structure, as demonstrated by the 2007-2009 bear market. Or, more typically, a three wave decline, as demonstrated by the 2000-2002 bear market. Until the first signficant wave completes, wave A, either combination is possible. To cover these two possibilities we have been tracking an ABC decline on the SPX charts, and a 1-2-3 decline on the DOW charts. Also of note on the weekly chart is the two green, wave structure, support lines. 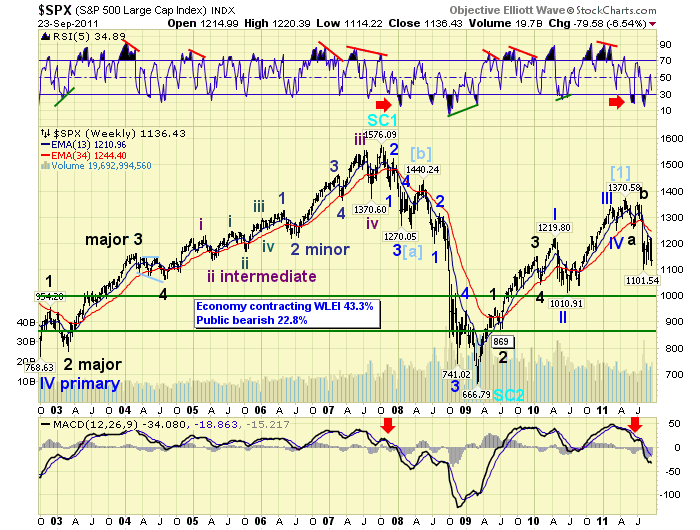 The first is at SPX 1011, the Primary wave II low. This level also represents a Fibonacci 50% retracement of the entire bull market. The 38.2% retracement level was hit exactly at the August low of SPX 1102. The second green line is posted at SPX 869, Major wave 2 of Primary I. This would be the logical wave structure support, should the first one fail. It represents a 70.7% retracement of the bull market. For the record there is one intervening level of support, the Fibonacci 61.8% retracement: SPX 936. The overall picture suggests we are in a bear market with the first level of support at SPX 1011, the next level at SPX 936, and the likely maximum level at SPX 869. The market closed at SPX 1136 on friday. From the SPX 1356 uptrend July high this market declined in three waves: SPX 1296, 1347 and then 1102 on August 9th. After that the market went into a trading range between SPX 1121 and 1231 for five weeks. This week it took out the 1121 low on thursday when it hit 1114. Our first thought was the low of the range, SPX 1121 on August 22nd, ended the downtrend with a failed fith wave, (higher than the third). We then tracked the market as if it were a counter-rally uptrend. This approach worked quite well for the past four weeks, until the market started breaking down after the FOMC meeting. Our counter-rally uptrend scenario suggested the market would hit the OEW 1240 pivot, and higher, from the September 12th SPX 1136 low. On tuesday, however, the market made a double top at SPX 1220 and started to decline. When it dropped through the OEW 1187 pivot, the previous short term support, on wednesday afternoon we knew something was amiss. Anticipate, monitor, and adjust. On thursday the SPX found short term support at 1114 and then rallied, from extremely oversold levels, to 1142 on friday. On thursday, however, the DOW made a new print low for the July downtrend suggesting it had resumed after several weeks of sideways activity. We then posted a special thursday night update: http://caldaro.wordpress.com/2011/09/22/thursday-night-update/. When we take into account these recent events. The new print lows in the DOW, TRAN, and NYSE. The fact that OEW has yet to confirm an uptrend. 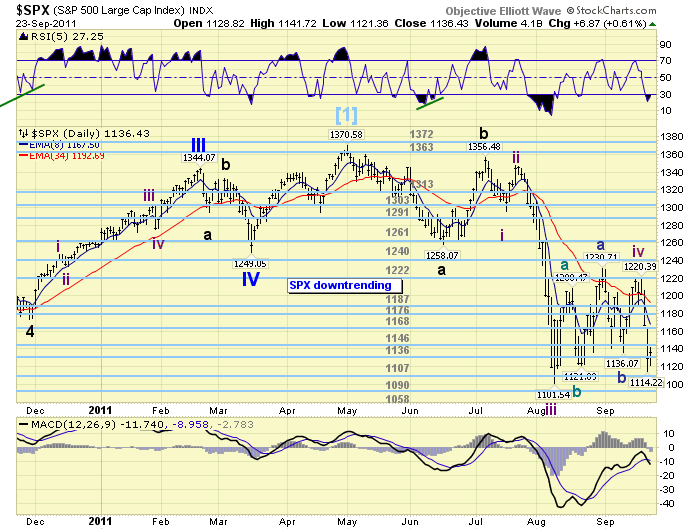 And, the somewhat sloppy wave counts on the SPX charts. We have shifted the short term count posted on the DOW charts to the SPX charts. This is now the preferred short term count. The alternate count is now posted on the DOW charts. We should know for certain, in a week or so, which of these two counts is the market’s count. The updated SPX chart is as follows. 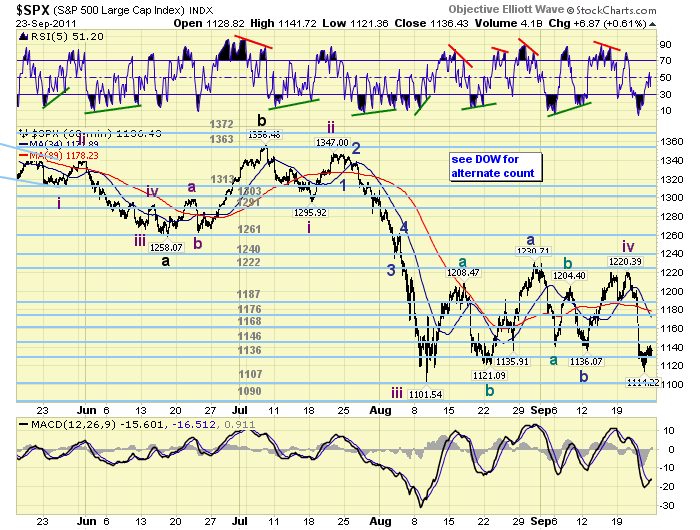 From the July SPX 1356 high the market has declined in four waves: Int. i SPX 1296, Int. ii SPX 1347, Int. iii SPX 1102 and Int. iv SPX 1231/1220. Int. i and iii were five wave declines, Int. ii was a zimple zigzag, and Int. iv was a complex inverted failed flat ending at 1220. We had observed these inverted failed flats during the previous bear market. Support for the SPX is at 1136 and then 1107, with resistance at 1146 and then 1168. Short term momentum ended the week around neutral. Anticipate, monitor and adjust. When we take into account the preferred short term count the anticipated medium to long term wave structure changes just a bit. The long term supports, noted in the long term section, remain the same. The wave structure for this bear market, however, can now be either a 5-3-5 ABC, or an abA-B-abC ABC. Both options are again possible. We did a Fibonacci analysis on the relationships between the Intermediate waves and arrived with the following numbers: @ SPX 1093 Int. waves iii thru v = 2.618 Int. i, @ SPX 1080 Int. v = 0.618 Int. iii, @ SPX 1074 Int. v = 2.618 Int. i, and finally @ SPX 1060 this third wave (trend) down = 2.618 the first wave (trend) down. Since we have OEW pivots at 1090 and then 1058, we’re probably looking at either the SPX 1093 relationship, or the 1060 relationship, for the end of this Int. wave v and downtrend. Best to your trading! The Asian markets were all lower on the week for a net loss of 5.0%. China and Hong Kong made new downtrend lows. The European markets were also all lower on the week losing 5.2%. The Stox made a new downtrend low. The Commodity equity group all dropped substantially for a net loss of 10.3%. Canada and Russia made new downtrend lows. The DJ World index made a new downtrend low as well and lost 7.7%. Bonds continued their extended uptrend gaining 1.2% on the week. The 10YR dropped to 1.70% before ending the week at 1.81%. The 30YR hit 2.75%. Crude tumbled 9.0% as its choppy attempt at an uptrend ended with a continuation of the ongoing downtrend. Gold also tumbled, losing 8.4%. We had expected both Gold and Silver to be in downtrends and this week’s action confirmed it. In fact, Gold has already come down to our anticipated support zone $1650-$1700, and even dipped below it on friday. As soon as this downtrend ends the bull market will resume. The USD continued to uptrend, especially against the Euro, and gained 2.5% on the week. The EURUSD lost 2.2%, and the JPYUSD gained 0.1%. New home sales kick off the economic week on monday at 10:00. On tuesday we have the Case-Shiller index and Consumer confidence. On wednesday Durable goods orders, and then on thursday Q2 GDP, the weekly Jobless claims and Pending home sales. Friday closes out the week with Personal income/spending, PCE prices, the Chicago PMI, and Consumer sentiment. The FED has two speeches scheduled. FED governor Raskin on monday before the open at 9:15 AM. Then FED chairman Bernanke on wednesday after the close at 5:00 PM. With this week representing the end of the month, and the quarter, it should be quite interesting. Remember we’re probably in a bear market, so tread lightly.